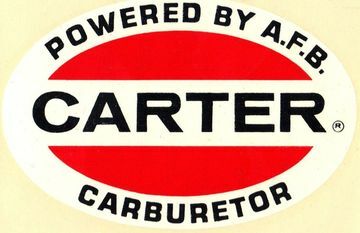 Carter Carburetor Company in St. Louis, MO was established in 1909 shut down in 1985. It was founded by William Carter, who started experimenting with automotive carburetors while running a successful bicycle shop. His first, cast brass carburetor could meter and deliver fuel more accurately than many competing units. He sold Carter Carburetor Company 13 years after founding it to American Car and Foundry Company, a firm older than Carter himself. Carl Breer wrote that, upon learning that the Ball family (owners of Ball & Ball) was planning to leave the carburetor business, he set them up with Carter, which continued to produce the Ball & Ball basic designs, which were used by Chrysler. Carter adapted carburetors for Willys Jeep four-cylinder engines, waterproofing them for water crossings and making it possible to keep the engine going even on a steep incline (the Y-S carburetor). Carter also produced the first American four-barrel carburetor, used for Buick’s 1952 straight-eight, and followed by the WCFB on the 1955 Chrysler C300. This was eventually superseded by the AFB. The final Chrysler use of four-barrel Carter carburetors was the Thermoquad, which used a lightweight plastic body, on the most powerful Chrysler engines. Carter produced Rochester Quadrajet carburetors for their rival maker whenever demand outpaced Rochester's ability to make them. They were identical to Rochester's units except the Carter name was stamped into the body. In Carter's final years in the early 1980s, they also produced Weber carburetors under license, such as the three-barrel Type 40IDA sold as replacements (or fuel injection retrofits) for 1960s and 70s Porsche 911 S.